Wedding planning is all about the details. And if you have been going stir crazy trying to find the perfect, unique wedding favor for your guests, look no further. Creative, custom wedding favors are easier to put together than you might imagine – and you won’t need a fairy godmother either! We’ve provided a list of unique and fun wedding favor ideas below. Wedding favors need to, above all else, be special. So a box of mints or matches simply won’t cut it. Pamper your loved ones with an indulgent beauty-themed wedding favor. Imagine receiving a bottle of invigorating foot soak salts at a wedding, you would love the bride for it! The great thing about a beautiful wedding favor like this is that it lends itself to exquisite packaging. 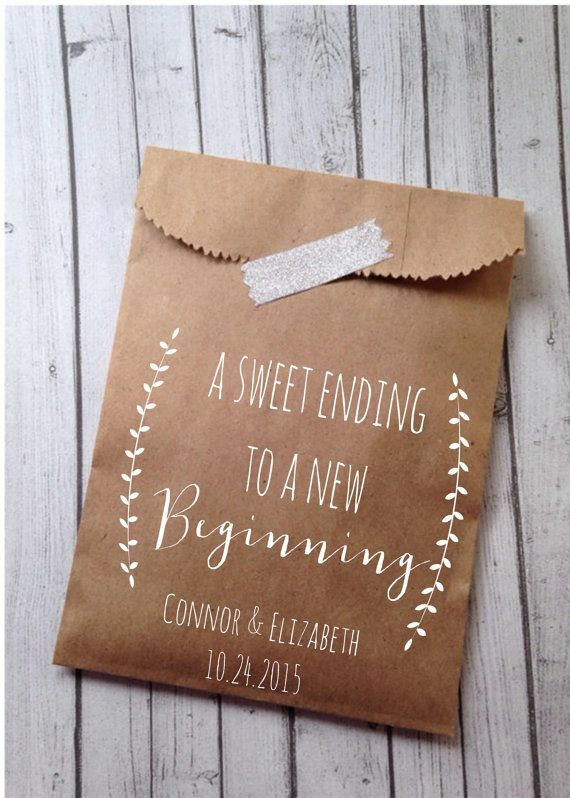 Be sure to take the time to theme your custom wrapping and labels to the wedding colors. If you have a nice little message you can include, even better. What you put inside the box or glass bottle is really up to you and will be dictated by the budget you have for your wedding party favors. 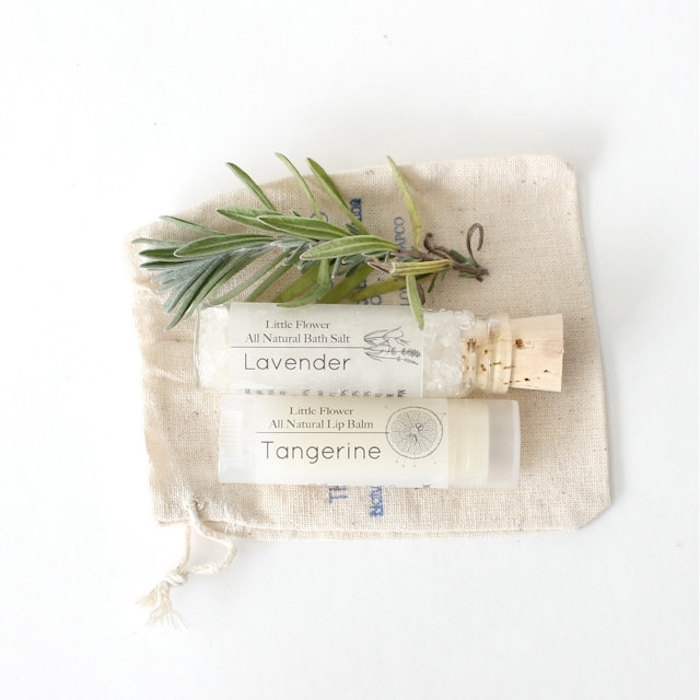 From bath salts to organic soap, aroma oils to lip balm, the options are quite literally endless. Buy a few large sized packages of the bath salts/oils and then divide them up into the smaller favor sized portions. This works out much better price-wise. Candles or potpourri sachets are lovely for spring themed weddings and you can even match the fragrance to the flowers you have at your wedding, to make it even more special. Once you are done, don’t forget to pop on that monogrammed label! You don’t have to be a foodie to love receiving a food themed wedding favor. Keep your wedding favors playful by setting up a ‘take what you want’ bar of goodies for your guests. Give them monogrammed treat boxes and let them have their fun choosing what they love best. You can set up a cookie bar, a candy bar, a granola bar, a chocolate bar, or any other treats you know they will like. After all, who wouldn’t want to receive a chocolate chip cookie wedding favor? It will make all your grown up friends feel like kids in a candy store all over again – and that high is hard to beat! You could also give them a clear glass jar filled with luscious ruby red strawberry jam, crunchy, comforting chocolate chip cookies in a box, beautiful organic loose leaf tea leaves…whatever catches your fancy. A homemade mix of granola can really oomph up its fabulousness if you put it into a pop color box and dig in a mini spade in a contrasting color. Have a local vineyard bottle some of their wine just for your guests and stick on custom labels. You could do the same with freshly roasted coffee beans from an artisanal producer. Scented sugars and salts make great wedding favors for avid chefs. Other options that will have your guests going ga-ga over their favors are DIY mojito (or other cocktail) kits, s’more kits or hot cocoa mixes – edible wedding favors will always be a hit among guests. This is a great option for a unique wedding favor if you have a destination wedding or even a wedding in your hometown. Your city slicker friends will love receiving tokens that remind them of their time spent in this part of the country. Local taffy, handmade coin purses, woven bookmarks, trinkets, handmade fans…have fun with regionally themed wedding favors. 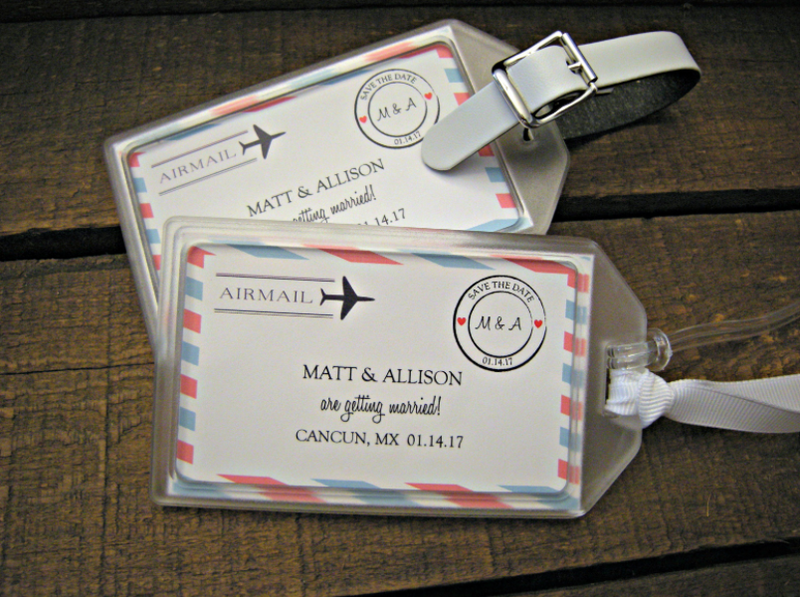 Alternatively, if you don’t have much time to organize this just before the wedding – especially if it’s a destination wedding and you are arriving with your guests, then handcrafted leather luggage tags with witty one-liners are a fun wedding favor to hand out. A for a personal or music themed wedding favor you can send your guests home with a themed flash drive in your wedding colors, packed with music and memories can be a real tear-jerker for your close friends and family. 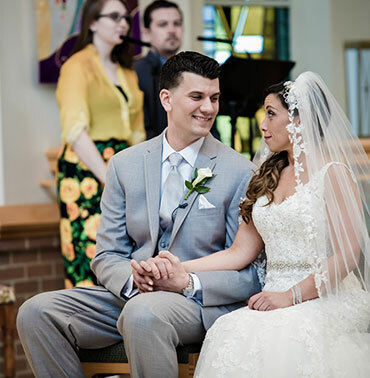 Pop in songs from the wedding, plus musical memories you shared with your guests as a couple or individually. 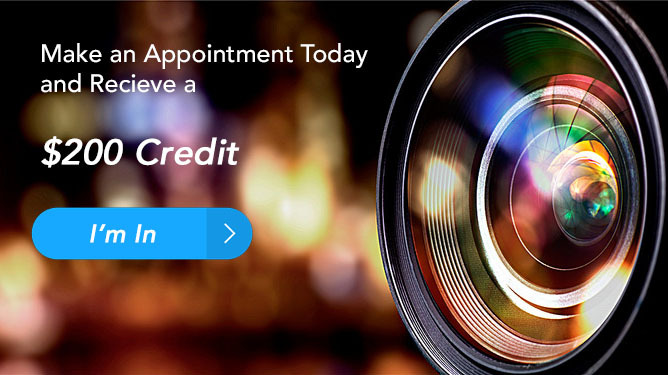 If you can, put together a video of memories or snapshots for them to hold on to as a keepsake of your relationship with them. Take a beautiful Instagram-style Polaroid effect photograph of you and your fiance with a nice abstract, artistic feel to it. Pop this on to the cover of the gift. And while a pen drive is diminutive in size, be sure to package it in a nice envelope that is embossed or printed with your personalized message to the guests. The personalized wedding favor will be loved for years to come. 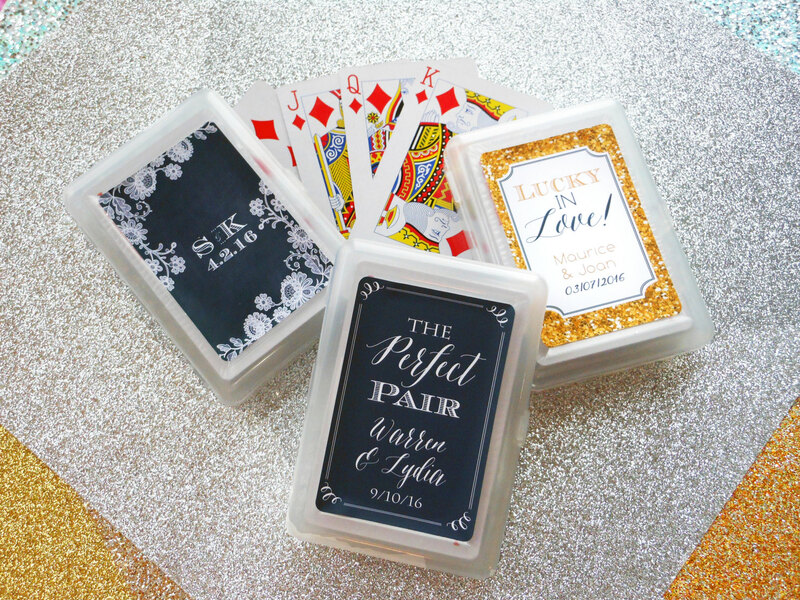 Give your friends a way to let their hair down and have them remember you each time they play one of your game wedding favors. It could be a pack of cards custom-printed to include fun lines; it could follow your wedding theme or have images of you and your friends and family. Or you could have a custom-made version of popular games like Happy Families to include members of your own family, or friends. The fun factor is high and you can go all out with these creative wedding favors. Giving your guests a favor isn’t mandatory but it is something that couples do to say thank you. When brainstorming ideas of what to give think about practicality and if the guests will use it again! Don’t forget about showing your personality and without a doubt, your family and friends will love their gift!